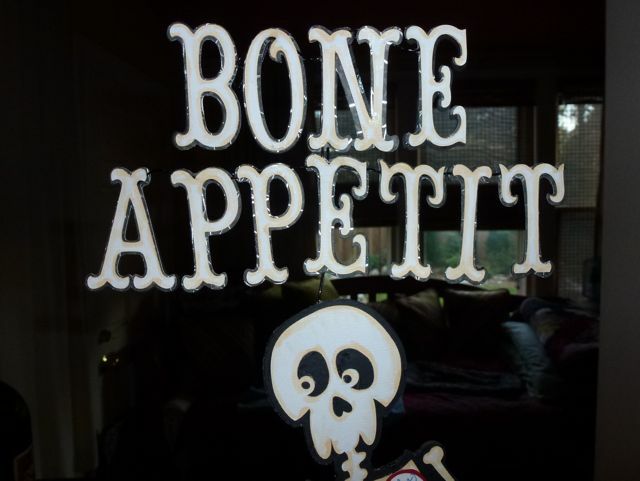 No bones about it – I love to craft and I love to decorate for Halloween. Here is my latest that builds on what I learned making the ghost bug. 1) Wiring your chipboard before gluing adds strength and will let you bend (slightly) your cuts. 2) Always wire both arms – even if you think you are only using one in your project. I actually learned this lesson on this project. Cut 4 base shapes from thin chipboard. 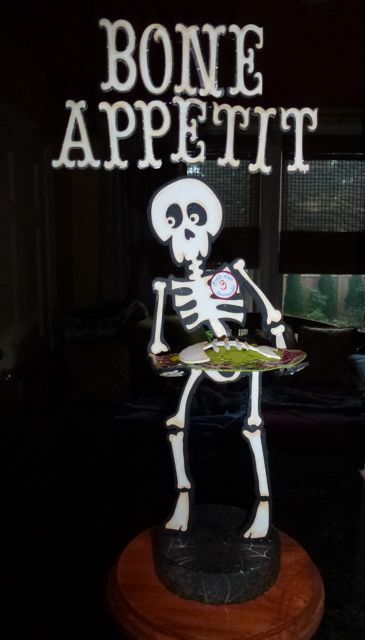 This is the skeleton from Happy Hauntings, cut at 11″. I have used painter tape to hold the shaped wire in place before gluing. The next step will be to glue one of the pieces of chipboard on top of the wired shape. For these type of projects, I find that Beacon’s 3 in 1 Glue works well. 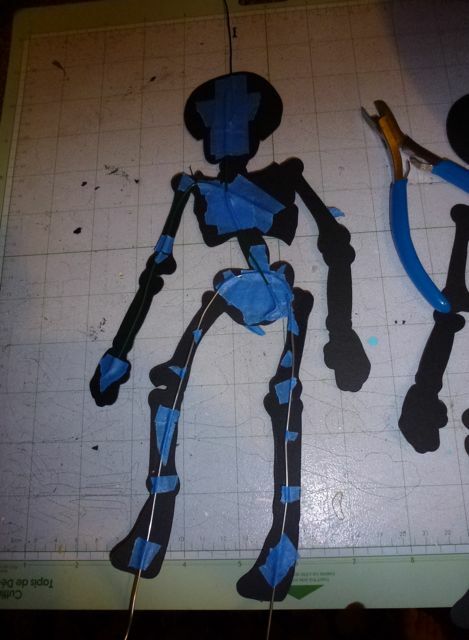 Add one more piece of thin chipboard to each side, and you will have a nice sturdy “skeleton” base to start your project. 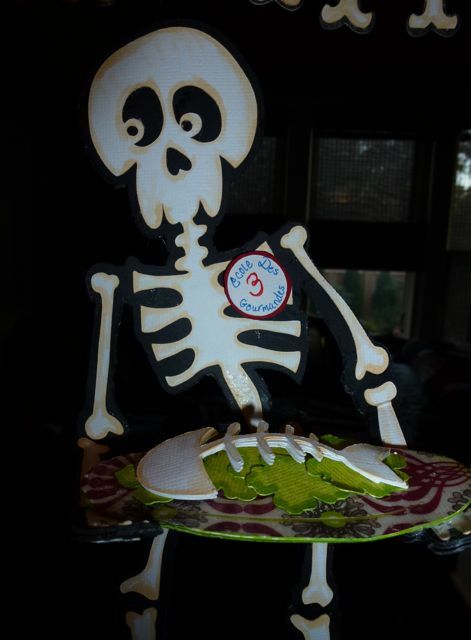 The skeleton cook attended cooking classes at the “Ecole des 3 Gourmandes” so he sports the signature patch as well. The base is a stryofoam circle that is covered in paper. The wires extending from the feet worked perfectly to attach him to the base. And the wire extending from his head worked great to attach the wired letters. And this one is staying home! Edited to add an additional picture in the daylight. What a great project and I’m so glad you are keeping this one, I was starting to feel positively selfish because I keep some lol. Wonderful tutorial, I feel inspired to wire :D. BTW did you see the Make It Monday how to make Washi tape video? I love your new butler and cook….and he looks like he’d be cheap to keep around and not eat you out of house and home….lol…how fun! What a magical project! I love the construction details and how clever the use of the Ecole des Trois Gourmandes button– Julia would approve!! I have never wired a cut before– how perfect a way to get movement and dimension from the cut! Thank you for including the construction photo! I really want to try this!! Incredibly helpful technique post!!! Love that this is free-standing. My favorite part of the whole fantastic project is that the fish is resting on a bed of greens. So funny and perfect! This must be how you unwind after travel. That in itself is impressive– I am usually a bowl of jello as my body gets over jet lag. 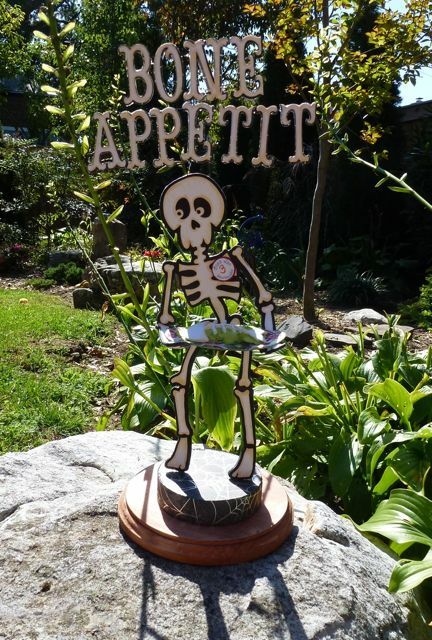 Love everything, the “punny” sentiment, the skeleton entree…it’s all together perfect, you did a faulous job! This is incredibly fun and creative! I love the idea of wiring cuts for movement and to make more independent 3-D designs. Thank you so much for the tutorial. I will be trying this. AMAZING JOB! I love your work.